Most of you know I love museums and art, mosaics and icons in particular. I’ve been looking at centuries of art depicting Jesus’ miracle at the wedding in Cana, and what surprised me is that many of them show her fading politely into the background or speaking to Jesus’ back as he turns away to do the important part, his head angled as if he’s maybe half-listening. Others don’t even include Mary! [See image above] I noted also the servants who fill the jars with water are there, but are usually shown as smaller, diminutive, sometimes darker even or in dull colors, because, like Mary, they are of lessor importance to the ‘main event’ and that’s how a person’s importance was shown. They are usually bent over their task, not looking up at Jesus as the disciples do. Yet the servants are the first to see the miracle, and Mary is the one who initiated it, even arguing Jesus into doing it, yet they are crowded out by the ‘important people.’ As I listen to this Gospel, I’m reminded how very often Jesus is taught or turned around by women, and how nearly every miracle is about the wholeness of community and restoration of someone to it, showing each individual Jesus touches as vital and invited to that blessed wholeness. How do we envision wholeness of community, the completeness of the kingdom of God? I think for too long we have unthinkingly imagined ‘community’ as those who look or speak or work or live like ourselves. We like to think we’re blind to such things, or at the very least that we do better than our forebears — but can we look around today and still claim that? In so many areas we have a long way to go, and both as individuals and as a nation we have to be constantly alert and corrective to any slipping back into that self-important perspective that puts only the ‘important people’ in central focus, and fades other people into the background, diminishing or omitting them altogether. Art is the language of history, and he wonders —if we change our focus can we better answer his son’s question; “why do those two have to walk?” Can we amend how we see…our whole world? “Not erase, but amend” Kaphar says. On this Sunday before Martin Luther King Jr. Day, having the reading of the miracle of water into wine at the wedding in Cana is one way people of faith get to encounter Christ’s story in our midst right now. We get to notice Jesus speaks in a dismissive even flippant-sounding way to his mother, and then think of times we’ve done so—what opportunities or wisdom did I miss? We hear Mary (far from a mere background character!) as central; she’s in-the-moment, her attention on all those gathered, and she sees the opportunity for Jesus to begin showing himself in such a joyfully generous way! The start of his ministry becomes a harbinger gift of the abundance of his love for us all. Did he look back and feel chagrinned at his words to his mother, after realizing she was right? Although the world of art tends to diminish the servants, Jesus never does, and they are the first to see the miracle even if not the first to proclaim it. Where do we see ourselves in this scene, as guests, disciples; usually. But today I want to be one of the servants, helping bring that holy water, witnessing the miracle up close! We hear the steward, also usually tucked in the background, acclaims the reversal of order that Jesus will bring to the world throughout his ministry; the best wine saved for when the people are running out of the inferior stuff, and that finest wine is in lavish abundance for all; guests, the disciples, the wedding party—everyone. Jesus teaches we are all invited to the wedding feast of the Lamb, of which this is a foreshadowing; do we believe that? Live that? 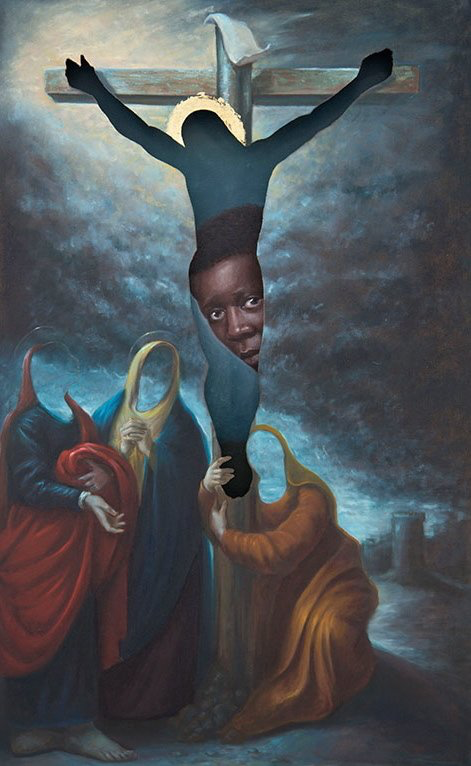 One of my favorite pieces by Titus Kaphar is called Holy Absence II. [See image #2 below] It features Jesus cut out from the cross and a black male peeking through the opening. What presence do you see in the figure of Christ cut out, the expression of the face looking up? What about the women below with no faces, as if empty of identity? When we look past the surface of our expectations, look beyond what we are used to seeing, what might come forward? Who do we look at without really seeing their faces? Why does Jesus usually look more Nordic than Middle Eastern, and does it bother us? What helps shed light on those things which our accidental blindness hides? The psalmist answers that question today saying, “In your light, O God, we see light.” It isn’t enough to trust our own perspectives, yet looking through the lens of God’s light, through scripture, through the eyes of each other as in this faith community, we truly see light. Anne Lamott said she made her son Sam go to church “to give him what I found in the world, which is to say a path, and a little light to see by.” (Traveling Mercies, Anchor, 2000) That’s the Light of God Martin Luther King Jr. helped to shine into our world, and it still does.